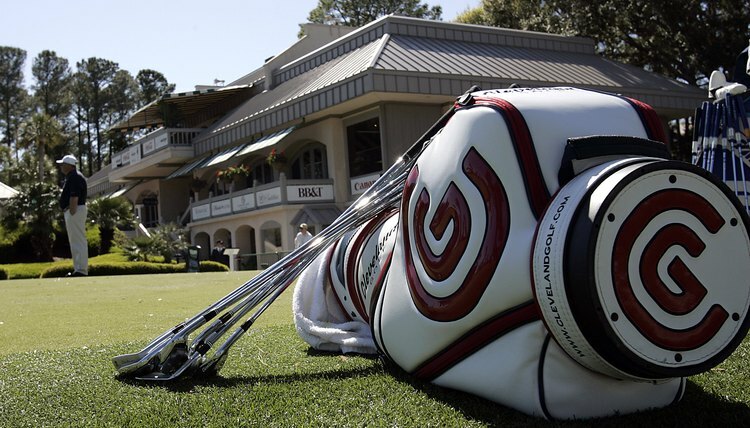 Players carry several different types of clubs in their bag for different situations. The United States Golf Association rules that players can carry up to 14 clubs in their golf bags. To a beginner, this might seem like a lot of different clubs just to hit one little ball. Not every golfer will carry all 14 of the allotted clubs, but golfers carry several different types of clubs for different situations. Traditionally, a golf club set consisted of a driver, several woods, matched irons and a couple of wedges. The player is usually left to select a putter on his own. The driver is the longest club in the bag and is used to hit a long shot off the tee. It is also club with the lowest loft angle. This combination makes the driver more difficult to hit than other clubs. However, when you master the driver, you can expect to get good distance. Golfers with a high handicap might find that a driver with a large clubhead will provide a large sweet spot and be more forgiving of miss hits. A flexible shaft will also add distance to the shot. Beginners can benefit from drivers with a loft of 10.5 degrees to 11 or 12 degrees, to help them launch the ball in the air. More experienced players who are concerned with accuracy might choose a stiffer shaft and a lower loft. Fairway woods are not made of wood anymore, but are composed of hollow metal such as steel or titanium. Like the driver, they provide the distance needed on long, straight fairway shots. Woods are long clubs, and the lower numbered woods such as the 3-wood have a low loft, making them more difficult to hit than most irons. Beginners may carry a 5-wood, 7-wood and even a 9-wood for greater loft, and advanced players might use a 3-wood and a 5-wood. Irons are versatile clubs because they can provide distance along with more accuracy than a wood. The traditional set comes with a 3-iron, with a low loft, down to the pitching wedge, which provides a high loft. Many golfers are setting aside their longer irons like the 3-iron and the 4-iron in favor of hybrid clubs. Specialty irons such as the sand wedge, gap wedge and lob wedge are considered basic clubs for use close to the green. Hybrids are becoming more popular and are now included in may golf sets in place of the longer irons. These clubs combine some features of woods with some features of irons. They are designed to provide distance and accuracy and are easier to handle than woods because of the shorter shaft. Hybrids are designed with a clubface that is weighted to help launch the golf ball into the air. Putters are designed for use on the green, where you will putt a few yards to the hole. Golfers hit a putt with their wrists straight and the club low to the ground. There are many different types of putters, from the conventional to putters with offsets, face inserts and long shafts. The best putter is the putter that feels and works the best for you. Because putting is such a large part of the game--equal to almost half of the strokes you are likely to take with other clubs--it is essential to have a putter you feel comfortable with and will use to practice.